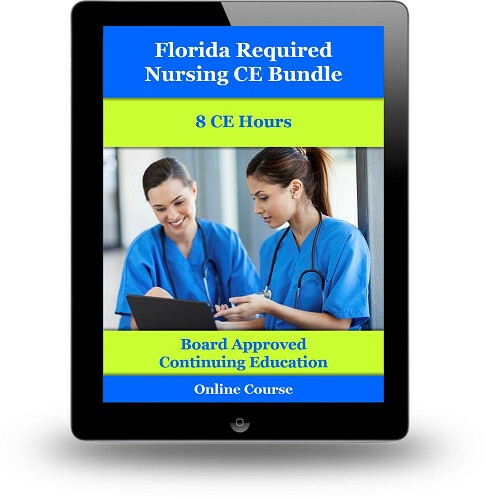 This course bundle includes all 4 required Florida nursing continuing education courses plus a one (1) hour HIPAA course. Two (2) hours on Prevention of Medical Errors. Two (2) hours of Laws and Rules of the Board. HIV/AIDS is now a one-time, One (1) hour CE requirement to be completed prior to the first renewal. Domestic Violence CE is now a two (2) hours requirement every third renewal. For example, if you renewed your license on January 31, 2014, you are required to complete the Domestic Violence CE before the January 31, 2018 renewal.